Last night I quilted for about an hour and a half. This is all I have completed with 2 days of work under my belt. Things might start moving faster though. I figured out a way to move this quilt through the machine in a more organized fashion. This saves time but even though I am using the side of my foot for guidance my lines aren’t always straight because I am giving up some control. Also, it uses a ton of arm power. My arms are feeling it this morning. It think it is worth it, if I save myself a few hours of quilting time. The non strait and uneven quilt lines add to the charm of the quilt anyway. **Note :: I updated my opening post for the month with some clarification on the rules of my give away. I do love straight line quilting! i haven’t seen the other blocks…but i love this one as well! As I have said in the past, and never tire of saying, YOU are Amazing! my guess is 175, and yes, it is looking awesome, and yes, I would love to have that quilt. 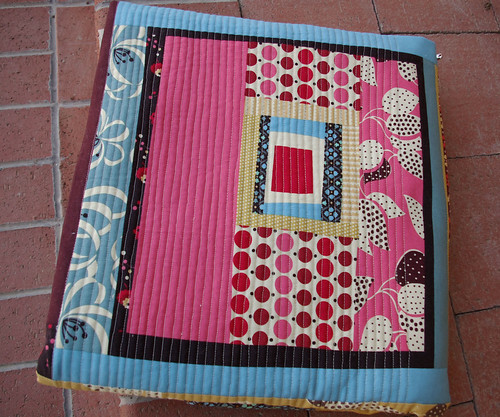 My mom hand quilts and that makes me exhausted, but I love the look and the idea of machine quilting! Oooooh, I love this quilt already! Have a fun Birthday month April! That looks very tedious. But it looks like it is going to be beautiful. 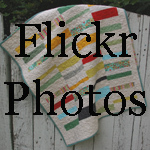 Of course our quilts always are! I meant your not our. Sorry!